This big guy was part of the booty I gathered on my photo safari while an Artist in Residence at the Grand Canyon Nat’l Park. One day I took a day off from painting my mural at the Shrine of the Ages and took my camera, car and roomate and just photographed all we saw! 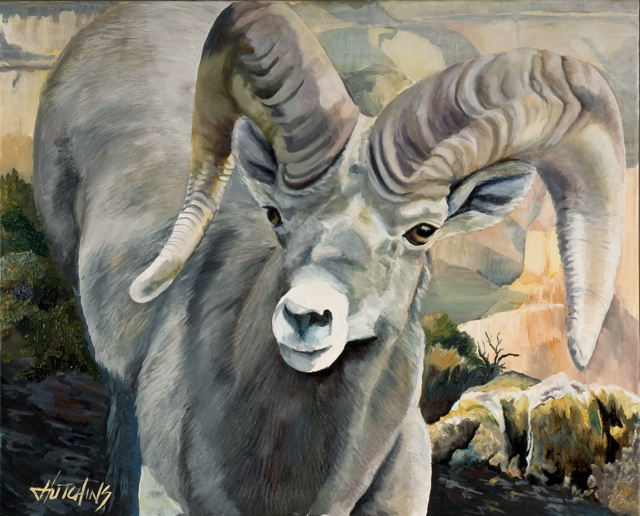 Nearing the end of the day, I took a walk down the Bright Angel Trail to photograph the Kolb Studio in the light I wanted when I looked WAY down the trail and saw what looked like a large heard of Bighorns! I told my roomie not to wait up for me, and RAN down those switchbacks with my camera in hand! When I got near I slowed way down. I was the only one with a camera. (I made a LOT of new “friends” that day because I collected email addresses of those that wanted shots). This was the Alpha Male. It was rutting season. These are normally solitary animals, but during the rut, they gather together to compete for all the females. There were a few smaller males, and a lot of females in the herd. Wow, I’ve seen bighorn from a distance before when I was rafting the Colorado River…they looked like moving specks on rocks far away. I felt fortunate to see those. But THESE guys! Wow, what a rare treat! They were just beautiful! So of course I had to paint them.